These gentle exercises can help you look and feel better after the birth of your baby. Unless otherwise noted, do them once or twice daily, beginning with three repetitions and slowly working up to ten. Remember to relax and breathe deeply between exercises. Lie on your back with your hands around your abdomen and your knees bent. Breathe in, then tighten your abdominal muscles while breathing out. When sitting or lying down, circle your feet clockwise. This should be done often to increase the circulation in your feet. 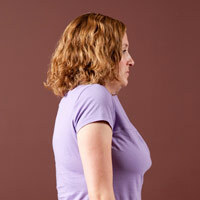 Circle your shoulders backward to prevent tight upper back and neck muscles. Tighten your pelvic floor muscles as though stopping the flow of urine, then relax. You can test yourself on this exercise occasionally while urinating. Lie on your back with one leg bent. Slide your other leg up toward your hips and then straighten it out again. Lie on your back with your knees bent. While breathing out, tighten your abdominal and buttock muscles so that your lower back is flattened against the bed. Lie on your back with your knees bent and your arms around your abdomen. While breathing out, lift your head off of the bed. Return to the starting position. Take a walk each day. Begin by walking short distances around the house, increasing the distance as you get stronger. 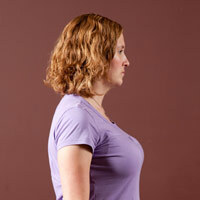 Good posture helps make this easier, so stand tall with your head up, shoulders back and stomach tucked in. On the third day after your delivery, check for an abdominal separation. To see if you have a separation, lie on your back with your knees bent. Place several fingers horizontally two inches above your naval, then breathe out while lifting your head and shoulders off the bed. The muscles should tighten around your fingertips. The number of fingertips that can be pressed inward indicates the degree of separation. Repeat this procedure weekly until the gap is less than two finger widths. If you have any questions or concerns about testing for abdominal splints, you may contact the physical therapy department at Meriter Hospital. Only when the abdominal splint is less than two finger widths can you advance to a curl-up. Lift your shoulders and your head off of the floor when doing the head lift. Instead of supporting your abdomen with your arms, straighten them out and reach for your knees. Only when the abdominal split is less than two finger widths can you advance to a curl-up. Lift your shoulders and your head off the floor when doing the head lift. Instead of supporting your abdomen with your arms, straighten them out and reach for your knees.